After the entertaining conclusion to the slam-bang antics of the 250th anniversary issue, John returns to the epic format by placing half the year in the Negative Zone. It’s astonishing to think that after seventeen years this was the first time Sue had been into the universe before, even though – technically – she had been inside as part of the “Manhattan gets sucked into the zone” Moench story of ’81. Not only this, but it appears that John has finally gained his muse. Some of the stories don’t come off – Cityscape asking us to feel pity at the last minute for a living city that’s killing its citizens – but all are readable and packed with verve. The predilection for continual info-dumps by the various aliens they meet in the Zone is unfortunate (The group telling each other what they all already know at the start of #256 is nothing short of shocking), but having the Fantastic Four re-envisioned as real-time explorers rather than reactive victims of the area is a refreshing new take on what had previously been used as a hollow plot device. True, most of the stories are pulp SF and often seem to be inspired by old episodes of the television series Doctor Who, but the pace of the first half of the year is a highlight only bettered by the second. There’s a perverse sense of humour emerging here, with Annihilus now given to answering the telephone, and with Byrne’s more sexually-aware Fantastic Four, we get several overt references to the married life of Reed and Sue, culminating in her second pregnancy, and the first explicit reference to homosexuality in #251. #254 and #256 also mark the first cameo appearances of the She-Hulk in the title, just before she was due to make her debut as a team member in April of the following year. Probably the stand-out in terms of radicalism is #252 and its “on its side for no real reason other than it’s different" structure. It’s a neat one-off trick, something that even the self-congratulatory tagline of “The World’s Most Innovative Comic Magazine!" can’t spoil. Biggest genuine innovation though? That would have to go to the decision to radically alter the FF’s costumes after over two decades… a decision that stayed with the book right until the end of volume one, and one that explains the rather silly visual joke I’ve employed on this page. (Or did, before the new site template meant I couldn't make this page inverted colours any more). 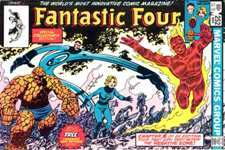 Actually, there’s a rival for biggest innovation in the form of the beautifully written and illustrated #258… the only issue not to feature a single member of the Fantastic Four until #496, another twenty years after this one. What both had in common was that both were given over to Doctor Doom. Here more than ever we get a sense of Victor as a real person, as we see his civic duties and the crafting of his plans. This is also the issue in which we get the infamous scene where Doom destroys a robot for allowing one of the X-Men to strike a match on its armour. Editor-In-Chief Jim Shooter cited this as one of many instances of John trying to enter into a mutual point-scoring exercise over old partner Chris Claremont, then still writer of the X-Men. In such a conflicting time at Marvel (two of the three writers immediately after John – Steve Englehart and Walt Simonson – have expressed no interest in ever working for Marvel again) it’s impossible to know the real truth behind so many differing accounts, but when I asked John about this he tersely described "Shooter" as being the propagator of "fiction". Along similar lines was #257, which gave over half its page count over to humanising Galactus. While many would perhaps baulk at this more “emotionalised", "feminine" style of storytelling in the Fantastic Four, this is still a wonderful exploration of one of the series’ most enigmatic characters, even if the revelation that Galactus appears in different forms to different races doesn't actually make sense considering his past physical encounters. Is it pretentious, and does it strip away from the weight of the mythology, rather than enhance it? Maybe, but Shakespearean allusions and Galactus discussing destiny with death itself is a series highpoint. The seventeenth Fantastic Four Annual (and the thirteenth to have an original story) is in many ways symptomatic of the Byrne ethos. It’s another love letter to Stan and Jack, acting as a sequel to the second issue, and also takes away some of the more light-hearted, intuitive elements and makes it scientific. Just as Sue’s power of invisibility gets transcribed as warping the light around her, we now learn that the reason why Reed could fool the Skrulls with pictures of b-movie monsters – a throwaway gag ending by Stan – is because he had studied their optic arrangement at length and knew they wouldn’t be able to tell the subtle difference between fakes and real-life creatures. While this is rather like explaining the bio-chemical reaction that causes Tom’s head to resemble the shape of an iron when hit with one in Tom and Jerry, Legacy is still an enjoyable story, and one of the best annuals of all. 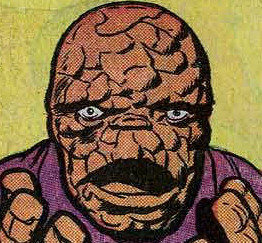 1983 was arguably the year when John Byrne changed the FF the most – not just with aesthetic changes, but Reed and Sue assuming secret identities and moving out into the city, Johnny getting his own apartment – yet all the changes feel a natural progression and not forced, as earlier ones may have done. A particular stand-out of the Byrne era is that while Kirby may be the king of panel layouts, no one seems to use angles and setting up of “shots” in the same way that John does, almost as if his panels are televisual mise-en-scene. Apologies for the absurdly pretentious description of comic book panels, but John’s eye for visual interaction, particularly in the era of the home video market, is a boon. Look at #259, and the agoraphobia-inducing aerial shot that tops page ten, or the long shots in the same issue. This isn’t a man imagining how the FF should look as a 2-D cartoon strip, but an artist visually conceiving how it could look in three dimensions. Once more the title dips back into using itself to plug other Marvel titles – Negative Zone sub plots are taken up in The Avengers #233-#234 and the new The Thing #2-#4, while Sub-Mariner turns up in the November issue simply to drag the Invisible Girl over to John’s Alpha Flight #3 & #4. Then there’s Blastaar stealing Annihilus’s cosmic control rod from Marvel Two-In-One #75, an addition that goes along with inessential but referenced reads The X-Men #146-#147, Captain America #276, Marvel Two-In-One #96 andThe X-Men #156-#157.